From February 21st to March 2nd in Yekaterinburg is being held a new exhibition “Look wider” authored by Natalia Podunova, participant of the winter season’s project “Young photography 2012″. The exhibition includes images from the recently released book of the same name, devoted to life of invalids on sight. A significant part of the publication is taken by the conversations with the heroes of the pictures, people who try to live among sighted society. Thanks to the translation of texts in Braille and special voice program, all objects of the exhibition are available for the visually handicapped. 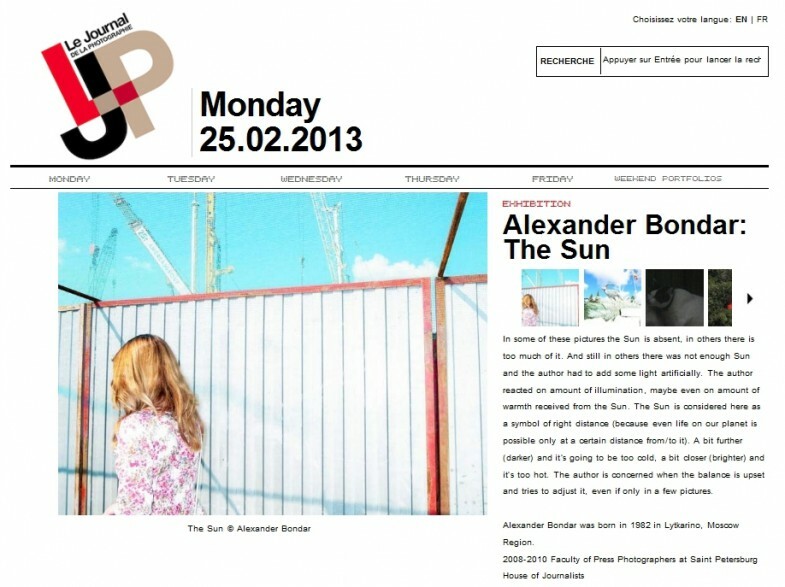 In French magazine “Le Journal de la Photographie” was published an article about Alexander Bondar’s exhibition “The Sun”, which is devoted to the subtle borders between the deficiency and the redundancy of the light. The Sun is apprehended as a symbol of the fidelity to the distance necessary for the optimal existence of subjects in space. The exhibition is open in FotoDepartament gallery from February 9th to March 14th. 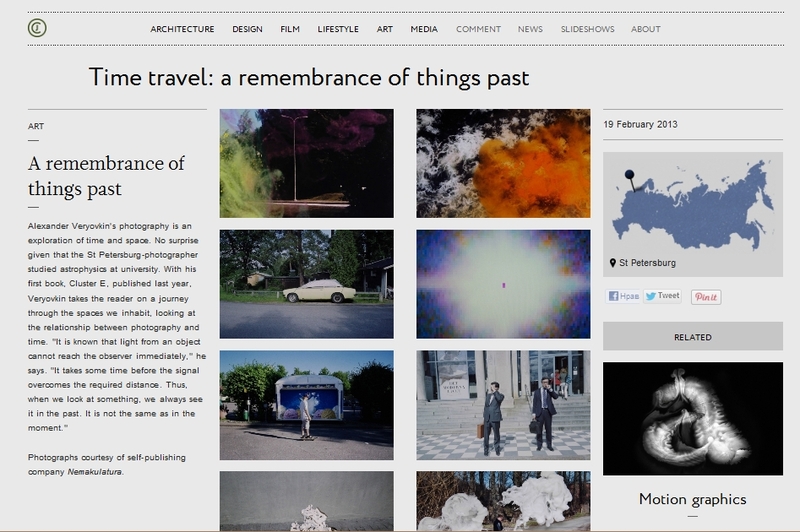 An important international festival of photography FORMAT’13 held in England from March 8th to April 7th. The only representative of Russia among 103 photographers is Tatiana Palygina, the author of the series “Colourless days”. FORMAT festival includes such activities as exhibitions, conferences, workshops, portfolio reviews, which take place at various venues. The main theme of the Biennale is the idea of the factory and mass production. Tatiana’s series also represented on the project “Young photography 2010″ tells about the life of office worker, drowning in daily routine. Photographer shows it not just like daily repetitive action, but like something global, that destroys people’s souls. 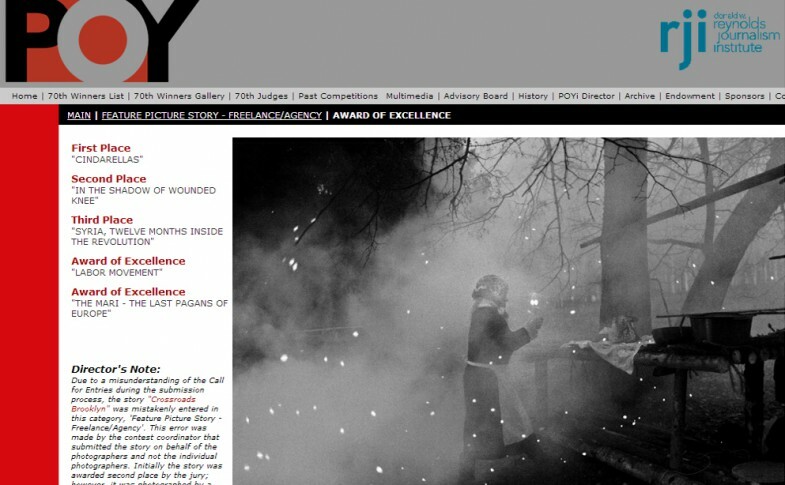 Tatiana Plotnikova became one of the winners of the 70th international contest “Pictures of the Year” (POYi) in the category “Feature Picture Story – Freelance / Agency”. Her series “Maris are the last pagans in Europe” research life and beliefs of minor indigenous people of the Republic of Mari El. The contest aims to create a visual archive of contemporary history on the basis of the outstanding reporting works. The expert commission of the POYi contains of MaryAnne Golon (The Washington Post), Brian Storm (MediaStorm) and other well-known specialists from the field of photojournalism. Not so long ago, in England there was opened a new Internet magazine The Calvert Journal, representing itself as «a guide to creative Russia». The main idea of the project lies in the desire to introduce a European English-speaking audience with the modern Russian culture. In the magazine you can read about Russian cinema, design, media, architecture, art, and about photography. 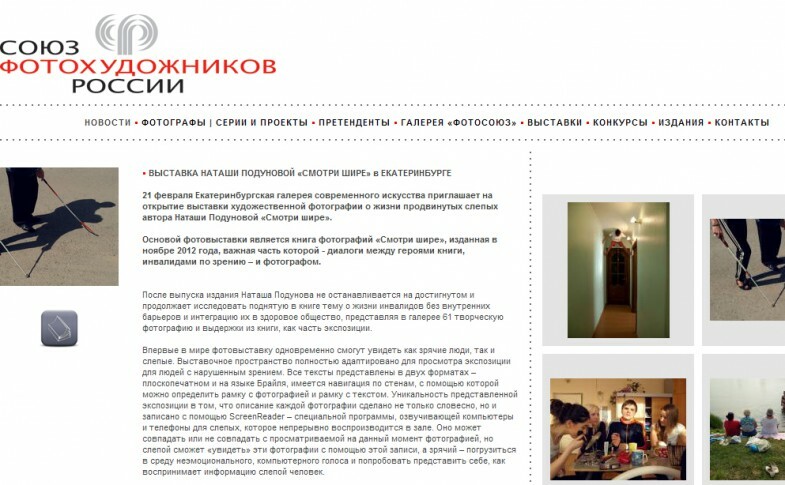 Recently there was published the interview with the Director of the FotoDepartament Nadya Sheremetova, where she told about Fund’s activities and its significance for the creative environment of the city. In addition, The Calvert Journal publishes works of interesting Russian photographers. Participant of the project «Young photography» Alexander Verevkin represented his book «Cluster E», which could be seen in St. Petersburg at the exhibition of summer season 2012. Let’s remind that Alexander’s project was devoted to the research of the interaction of space, time and light.